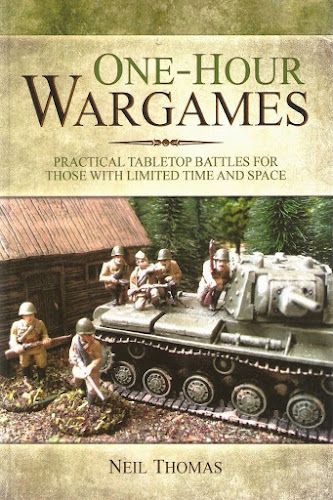 Now that SELWG is behind us it's time to start thinking about a new project. Of course there's lots to choose from: Celtic chariots, robotic mummies and all sort of old Citadel lead for Frostgrave. Whilst putting the SELWG table together I had an idea for a two part scenario that starts with the Vikings disembarking from their ship and attacking the Monastary. My idea was to have a Homeland type scenario with the Monastary defended by a Saxon warrior priest and a motley group of Angry Monks, with a few levy from the local village and perhaps a single point of local militia (warriors). I've made the base for this figure using one of the Basius II pads that I received earlier this year through a Kickstarter project. If the Vikings win they then have to head back to the longship as per the Revenant scenario. Since there will be casualties I need to balance the game, perhaps with the number of Revenant units determined by how many monks have died, or perhaps giving 'killed' Vikings a % chance of discovering they only suffered a minor injury. We'll see. I didn't have time to complete the extra figures for Sunday's event but I'm still keen on exploring the idea. Since John Fry is organising another SAGA day in November I also thought it would be fun to turn my existing Anglo Dane warband into something more ecclesiastical. I suspect I'll get thrashed with them, but it should still be fun and I will at least learn how they play against different warbands. I also have another project In the pipeline that will require additional painting. We now have four different warbands (including the Revenants), each of which has seven available points. I thought that it would be fun to liven things up a bit by introducing a bit of uncertainty into warbands. A recently published fan made ruleset attempts to do this by randomising which warbands will play (link). These rules work best if players have access to several different warbands (ideally six). 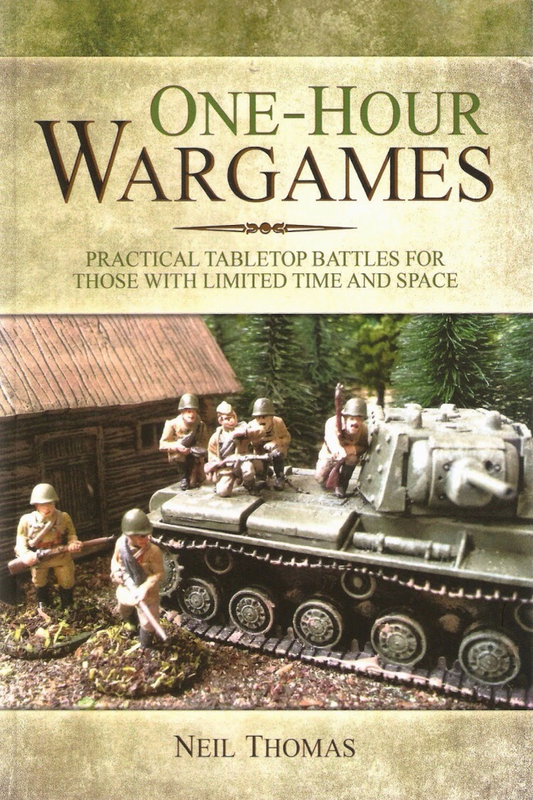 Since that is a bit of a tall order, I thought I'd try to adapt the system published in Neil Thomas' excellent One Hour Wargames. Using the random warband generator means that a single warband can be used - with varying numbers of hearthguard, warrior and levy units selected by rolling a d6. I've put together provisional lists for my Anglo Danes, Vikings and Norse Gaels but need to paint up a few extra units to make the system work. The Revenants won't really work for this (since they consist of only a single troop type). I'll post more details once we've given it a go. 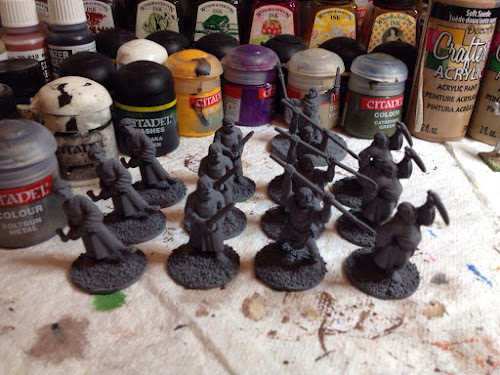 Painting up extra units is something I'm doing anyway, since I intend to use each of the SAGA warbands as the nucleus of a Lion Rampant retinue. Any excuse eh?! 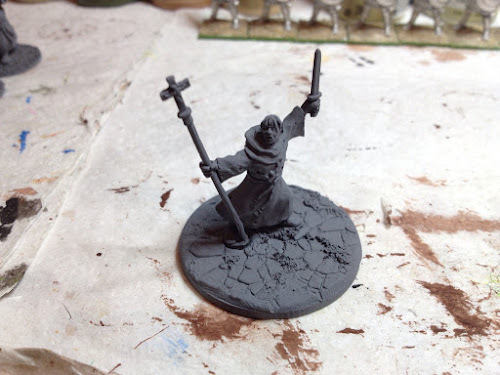 One of the d6 options will include a priest (I thought we could also randomise which of the three priests is available). To give good variety I think each warband needs to have at least 8 points of figures available (plus a priest). Some options (such as Viking levy) should be made rare within the list. Shall look forward to seeing where this goes! Just calculated that I need nearly 50 additional painted figures (across three warbands) to make the random aspect work. So it may take a while! Frostgrave - Better with a DM?